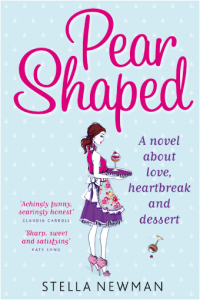 One of my favourite books ever is Pear Shaped by Stella Newman. I’ve read it tens of times (maybe getting into the hundreds now) and was re-reading it on holiday when I once again had a hankering for the ‘compost cookies’ Stella mentions in the book. At the end she references the original recipe, invented by Christina Tosi for Momofuku Milk Bar in America, and I decided to try it when I got back to the UK. However, upon finding the recipe I noted that it required ingredients you can’t easily find in the UK (like graham crackers and corn syrup). Rather than specially source the ingredients, I decided to tweak an existing recipe of mine and break my book-review-only streak so far to share it! Just a note before we begin: I use a mixture of cups and grams measurements, as I find cup measurements useful for some things (like flour) but awful for others (like butter). 30g crushed corn flakes (which again amounted to roughly one cup). 1. Preheat oven to gas mark five/190 degrees/375 farenheit. 2. In a big bowl cream the butter and sugars together, ensuring all of the muscovado sugar is smoothly incorporated. 3. Add eggs, mix in vanilla and beat until well combined. 4. Add flour, salt, baking powder, bicarbonate of soda and mix. Add in chocolate chips and nuts. 5. Tip dough onto a clean, lightly floured work surface and gently work by hand. 6. Divide the dough into equally shaped balls. 7. Place the balls on a baking tray lined with greaseproof paper (six balls evenly spaced out worked best, for evenly-shaped cookies and no overlapping). 5. Bake in the oven 10-15 minutes until very lightly browned, depending on how soft and chewy you like them (mine took 13 minutes). 6. Let cool on a rack and enjoy! 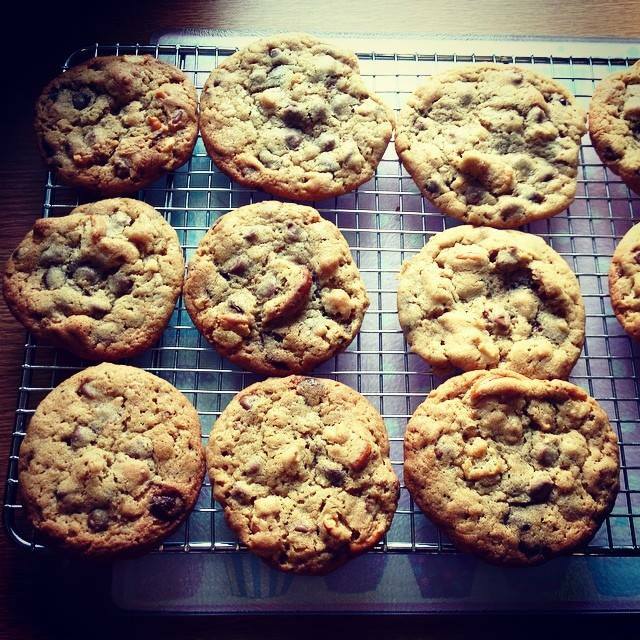 This recipe yields quite a lot of dough and half my batch made 14 generous cookies. If you need a small batch, you can either half all of the quantities or, like me, freeze half the dough (making sure you double-wrap it in clingfilm and label it with the date – it will keep around 4-6 weeks). One last note – if you fancy going the whole hog and ordering in ingredients specially (or you’re lucky enough to live in a location where all ingredients are readily available) then try the amazing Christina Tosi’s recipe, available in the Momofuku Milk Bar cookbook: http://www.amazon.co.uk/Momofuku-Milk-Bar-Christina-Tosi/dp/1906650764/ref=sr_1_2?ie=UTF8&qid=1407084820&sr=8-2&keywords=momofuku. Exclusive extract of Low Expectations!